Eye twitches can be a temporary, minor annoyance, but in severe cases they can affect your vision and cause a great amount of discomfort. 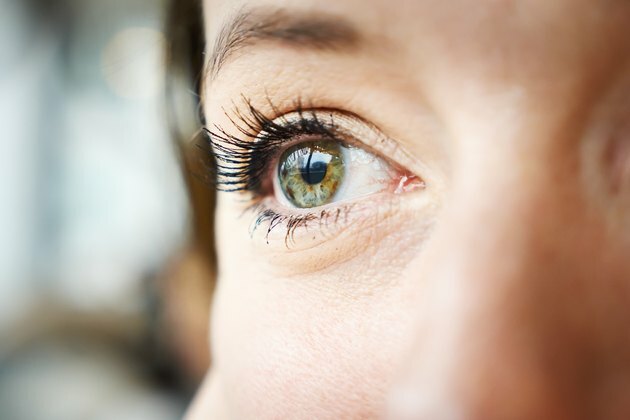 Medically known as myokymia, eye twitches can be caused by stress, fatigue, alcohol, caffeine, allergies and eye strain, although the cause is often unknown. Eye twitching, except in extreme cases, is not the result of lack of proper eating habits, but nutritional imbalances in the form of lack of vitamins and minerals can play a role, according to doctor of optometry Burt Dubow of the All About Vision website. The vitamin and mineral deficiencies can affect the function of your muscles, including those of the eye. Deficiencies can have a variety of underlying causes, depending on what vitamin or mineral is lacking. Eye twitching is characterized by involuntary contractions of the eyelids. It most often involves the lower eyelid of one eye, but the upper eyelid may also twitch. In milder cases, the twitches will occur every few seconds over the course of several minutes. In more serious cases, known as blepharospasm, both eyelids will twitch and one or both of the eyelids may stay shut for several minutes at a time. Electrolytes are electrically charged minerals that are in your blood, urine and body fluids. They are responsible for, among other things, controlling muscle action, including the muscles of the eye. Electrolytes include sodium, potassium, magnesium, calcium, chlorine and phosphate. An imbalance of electrolytes in the body, either too many or too few, can lead to muscle twitches and spasms and are caused by changes in the amount of water in your body; electrolytes and fluids need to be in balance for muscles to function properly. Common causes of electrolyte imbalances include vomiting, diarrhea, sweating, certain medications or kidney problems. If your eye twitching is the result of an imbalance due to dehydration from vomiting, diarrhea or exercise, drinking electrolyte-enhanced water or sports drinks can help. A doctor will need to diagnose any other cause of electrolyte imbalance. Vitamin B12 is an essential vitamin that is soluble in water and is found in a variety of foods, including fish, meat and dairy products. It helps maintain healthy nerve and red blood cell function, as well as being a factor in the building of DNA. Vitamin B12 deficiency can lead to shaky movements, spasticity, muscle weakness, hypotension and vision problems such as eye twitches. According to the Mayo Clinic, symptoms may occur when vitamin B12 levels are just slightly lower than normal. Consistent vitamin B12 deficiency may be the sign of an underlying medical disorder and should be diagnosed by a doctor. Vitamin D is a fat-soluble vitamin that is important for maintaining several functions in the body, including the absorption of calcium. If your vitamin D level is too low, you may not absorb as much calcium, which can lead to weaker bones and possibly eye twitches because of the role calcium plays in muscle contraction. Vitamin D can be obtained by exposure to sunlight and in foods such as fortified milk. Supplements that contain vitamin D are also available; however, because vitamin D is fat soluble, excess vitamin D will not be excreted through the urine, so you can overdose if you take too much. Talk with your doctor about the proper dose of vitamin D for your individual needs. Most eye twitches are not a cause for concern and will disappear in a matter of days. If you suspect your eye twitches are the result of a lack of electrolytes due to sweating or illness, consume water or sports drinks enhanced with electrolytes. If the eye twitching continues for more than a week or is severe, consult an eye doctor. He may refer you to a general practitioner if nutritional imbalances are suspected. A general practitioner will perform blood tests to verify if vitamin D or vitamin B12 deficiencies are the cause.